Back in the old days, and we're talking pre-1989, pre-GameBoy. The only way to get your handheld fix was from Nintendo's Game & Watch games, their innumerable clones, and from the not-quite-so-handheld tabletop games. These compact video games came around in the late 70's and all kinds of Western and Eastern toy companies got in on the act. By the early 80's there was, as was the case with the home videogame sector, a glut of samey games, with not a great deal to differentiate the gameplay on offer. So, how does a company make a product stand out of the crowd? Why, gimmicks, of course! The Tomytronic games were at the time the ultimate in playground prestige, they cost more than other games, and heck, they were about as future as a 6 year old could get their hands on. 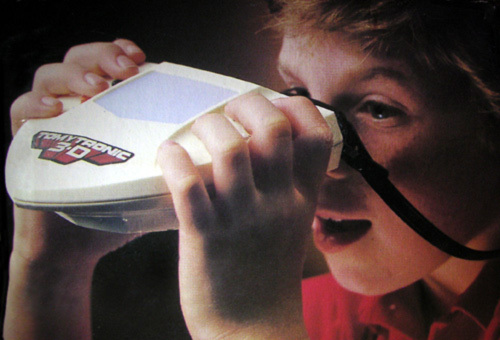 You felt like you were Luke Skywalker looking through his crazy space binoculars. They even came with a neckstrap so that you'd never have to physically put the game down in between bouts, which believe me, when you first got one, you didn't want to do very often. The design of the games casing was at the time one of the most exciting things about the games. Crossing a viewmaster with some kind of spaceship to create an object that felt like it had actually come from the future. Its compact size made it more portable than the larger tabletop games, increasing the popularity of them as more kids carried them everywhere they went. Part of the appeal of the Tomytronic games was that they created a more personal experience than other games. You were the player and your friends around you couldn't peer over your shoulder to see what you were up to. This in turn made the kids want to experience it for themselves even more, often leading to people waiting in turn to have a go on them at school lunchtime. It wasn't long before kids found out the game's weakness though. Due to the way the LCD was lit, You would find yourself suddenly plunged into darkness as some other mean child held their hand over the light window. Much swearing and moving around would follow. 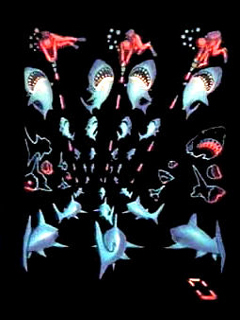 The four initial titles were Thundering Turbo, Planet Zeon, Shark Attack and Sky Attack. The games were simple, as LCD games tended to be. They look crude to us now but I remember as a child them being as close to reality as the latest current generation titles. The 3D effect was achieved by there being two different LCD panels, one image being fed to the left eyepiece, the other to the right. They were lit by an opaque window on the top of the unit. The color was given by a simple transparent overlay behind the LCD displays. 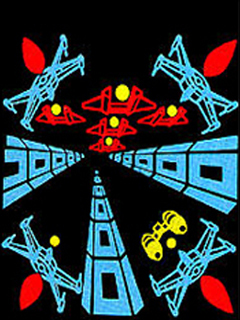 The end result was the one of the most immersive and memorable handheld games of the early 1980's. 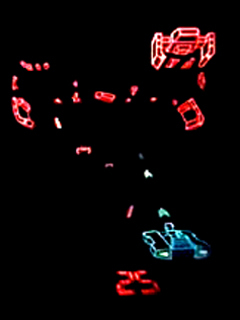 Thundering Turbo is a traditional LCD racing game, instead of doing laps of a track or anything, the game keeps a score of how many cars you've overtaken, adding a point when you overtake, subtracting one when a car passes you. 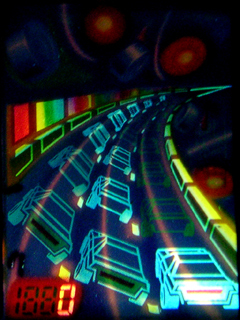 There are three lanes on the never-ending track, you have three lives, and you get to race through three races, each lasting around 100 seconds. All you have to do is overtake the other cars and try not to crash. Sounds simple, but back then, you could play for hours. Planet Zeon is heavily influenced by some of the popular sci-fi film of the time, including Star Wars. The game is set in some kind of metal space trench and your spaceship is kinda X shaped. The aim of this one is to shoot the alien bad guys but at the same time keep an eye on your little fuel meter. Little fuel pods occasionally travel down the trench and you have to intercept them in order to carry on with your mission. Sky Attack is a counterpart to Planet Zeon, as if while your comrades are up in space, you're down on your planet's surface defending it in your little tank. Up in the sky there is an ever-encroaching alien armada and you move left and right, again in a possible 3 lanes. The alien craft march on towards you, intent on dropping their little explosive payloads right on top of your head. There's more evidence of movie design snitching in that in this game - your tank and the alien craft look remarkably similar to the designs of the movie Tron. I wasn't complaining though, as intellectual property theft wasn't something I was thinking about as I blasted those ships from the inky black future-sky. Shark Attack, as the name implies, was a game about being attacked by sharks, or it could be said you play the part of some maniacal shark attacker. Certainly if one man managed to butcher as many sharks as I did playing this game I'm sure some animal protection agencies would be quite concerned. In the game, the sharks started off at the bottom of the play area and swam into the distance, they would then do a little turn and start heading straight at you. Your little scuba man seemed to have replaced his traditional spear gun with some hi-tech laser weapon (of course). He would've had no chance against this many sharks with just a lil harpoon. 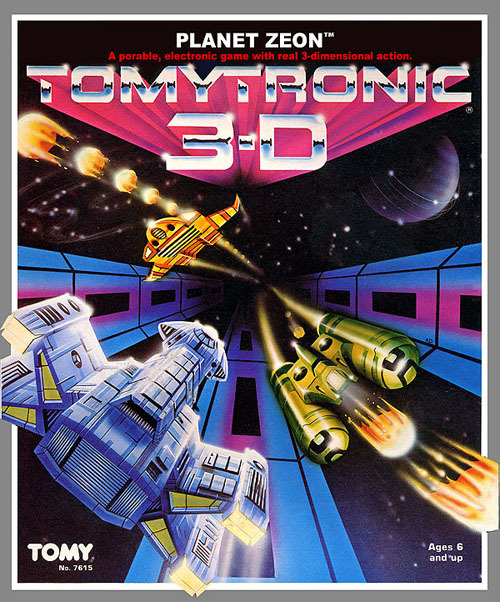 As a child, this was one of the most satisfying of the Tomytronic series to me, as when you blasted a shark, they turned into satisfyingly meaty chunks of ex-shark and drifted back into the chasm. There are other games in the 3D series, more uncommon ones that I myself have not played and only actually seen on the internet. Only the four games I mentioned above seem to have had a general release in the west, the other games appear to be Japan only. Jungle Fighter, Sherman Attack and Dogfight were the games I never saw. There was a limited release of the game Dogfight, renamed to 3D Stereo Skyfighters. The design of the case is markedly different to the original series due to it having stereo sound. Unfortunately, due to the limitations of the LCD technologies available at the time there were only so many types of game Tomy could make to take advantage of the 3D system they had created. For now, the games would remain a technological one-off. Nintendo tried, with the Virtual Boy, to replicate and improve upon the experience delivered by the Tomytronic 3D games, only to largely fail due to a lack of portability, and color - features that the Tomytronic games had over 10 years before the Virtual Boy. The sad fact is that after the failure of the Virtual Boy we appear to be destined to never again have any kind of handheld 3D in your face action. Sniff!